For those of us living in the United Kingdom, a current exhibition at the British Museum, and a recent three-part television documentary, have raised some interesting questions about "Celtic" identity. The exhibition ("Celts - Art and Identity"), to my mind, explores these questions with a degree of subtlety, whereas the BBC documentary ("The Celts: Blood, Iron and Sacrifice") seems to me to perpetuate, rather than to challenge, some of the myths that have emerged about "the Celts" over the last few centuries. 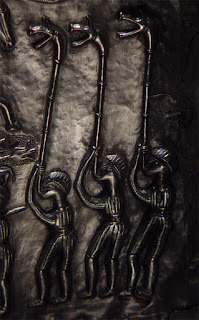 To talk of "the Celts" at all (rather than, say, "Celtic art" or "Celtic languages") makes certain pre-suppositions that ought not to remain unchallenged. It is unlikely that anyone living in Europe prior to the late 17th Century AD ever thought of themselves as "Celts." The exhibition does make clear that the term "Keltoi" was first used by Greek writers to refer to people whose culture was very different from their own. As he marched his legions through Gaul, Julius Caesar never thought that he was fighting "the Celts." 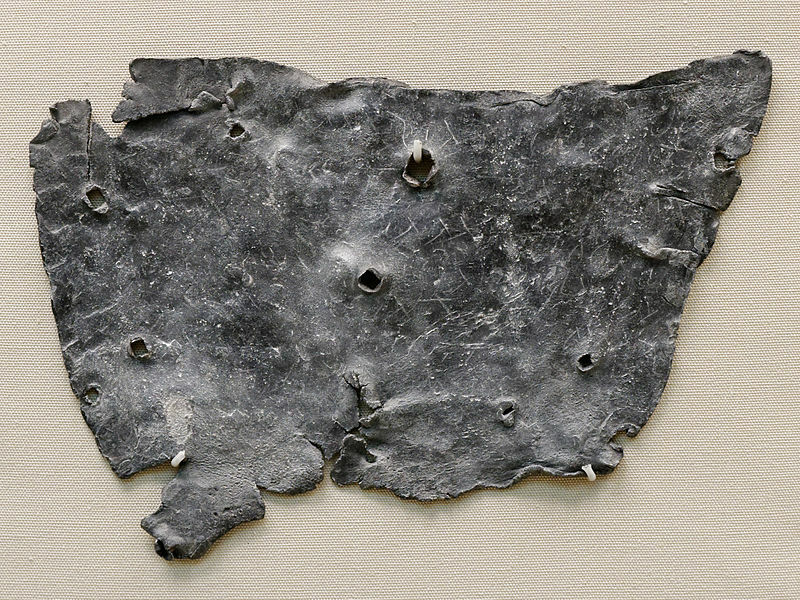 He referred, instead, to "Gauls," "Belgae" and "Britons," but he recognised that none of these groups were homogeneous, and one of his favourite military strategies was to play one tribe off against another: the Aedui against the Arverni and Sequani in central France; the Trinovantes against the Catuvellauni in southern England; much as later European colonialists would play Tutsi against Hutu in Rwanda, Nuer against Dinka in Sudan. There are at least two potentially coherent uses of the term "Celtic" in relation to the ancient cultures of Europe. The first is linguistic - people who spoke "Celtic" languages. The idea of a "Celtic" language group is a modern construct, but the surviving Celtic languages (Irish, Scots Gaelic, Welsh, Manx, Cornish, Breton) clearly have more in common with one another than they do with other languages, and it is reasonably clear that most of the people referred to by Caesar as Gauls, Belgae and Britons spoke languages closely related to these. The second is art-historical: there is a style of art, extending from the 4th or 5th Century BC to the 7th or 8th Century AD, which, for want of a better term, has been described as "Celtic." Unsurprisingly, given its focus on the art, the British Museum takes the art-historical definition as its starting point. 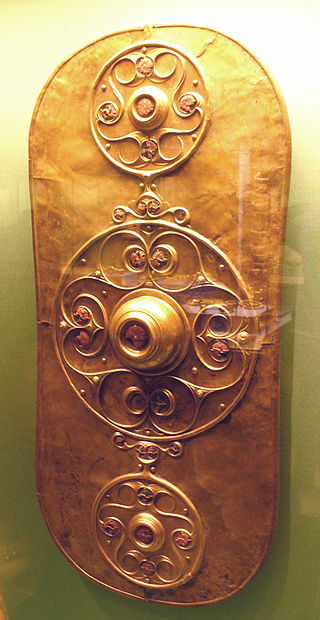 The "Battersea Shield," almost certainly made by craftsmen and used by a warrior who spoke a "Celtic" language. Photo: QuartierLatin1968 (licensed under CCA). It is not safe, however, to assume that all "Celtic" art was produced by people speaking "Celtic" languages. There is a major problem with the vision presented in the documentary series, of a "unified" Celtic culture extending from Portugal in the west to Turkey in the east: it ignores the existence of the Germans. Roman writers, including Caesar and Tacitus, make a clear distinction between "Gauls" and "Germans" (Germani or Alemanni, terms sometimes, but not always, used interchangeably), and linguists certainly distinguish "Celtic" from "Germanic" languages. It is almost certain that some of the masterpieces of "Celtic" art were produced by people who spoke Germanic (and other) languages, but it is not always easy to determine which ones. Let's look at some specific examples from the British Museum exhibition. The "Lord of Glauberg." Photo: Heinrich Sturzl (licensed under CCA). The so-called "Lord of Glauberg," a sandstone statue of an elite warrior found in Baden-Wurtenburg, is probably a representation, however stylised, of a real man: a burial found nearby had a torc almost identical to the one depicted on the statue. Glauberg straddles the border between the Celtic (Gaulish) and Germanic-speaking worlds, so was he a Gaul (perhaps married to a German), or a German (perhaps married to a Gaul)? Either way, he might well have been bilingual, and is unlikely to have used either term to describe himself, citing, instead, a tribal name that may well have become lost in the mists of time. Torcs, in themselves, are often seen as indications of "Celtic" identity, but they may well have been worn by people who did not speak "Celtic" languages, and the Glauberg torc (even in art-historical terms) is far from typical of those found in areas where those languages clearly were spoken. 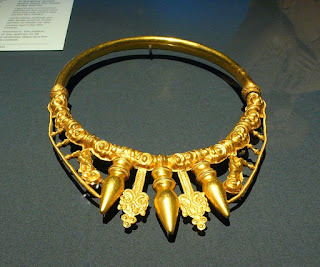 The Glauberg Torc. Photo: Rosemania (licensed under CCA). 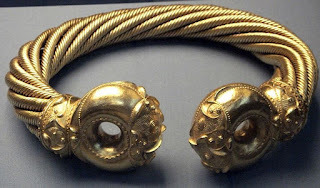 Gold torc from Snettisham, Norfolk, a far more typical example of "Celtic" gold-work. Photo: Johnbod (licensed under CCA). 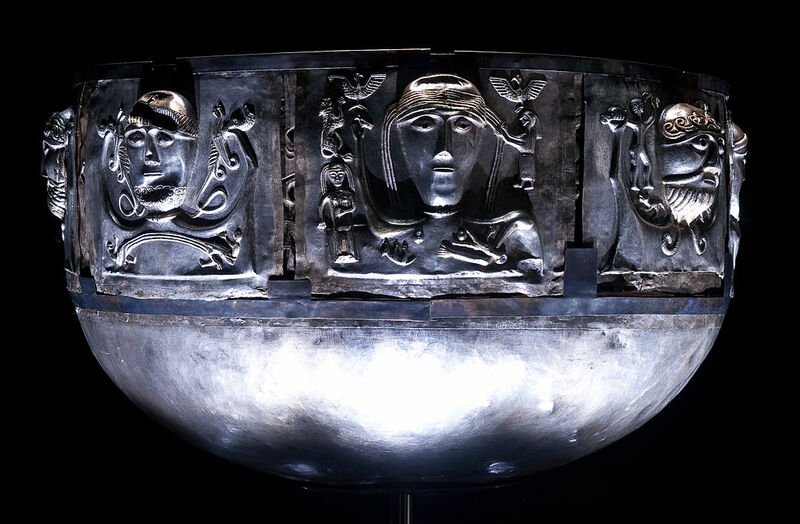 Even more problematic is the Gundestrup Cauldron, a spectacular masterpiece of the silver-smith's art currently on loan to the British Museum from the National Museum of Denmark. 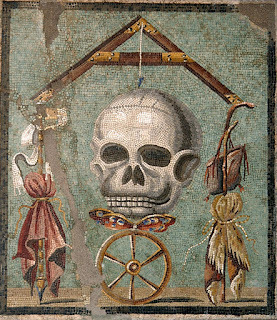 The smiths who made it were probably Thracians, and the cauldron was ultimately buried in Denmark: it is very unlikely that "Celtic" languages were spoken either in Thrace or in Denmark, and yet there are several themes in the iconography that suggest a link to the Celtic-speaking world. 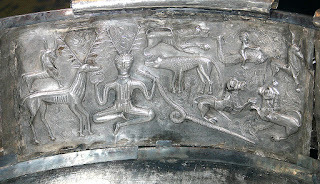 The Gundestrup Cauldron. No photograph can truly do justice to this extraordinary artefact. I had seen it before, in the National Museum of Denmark, but would happily have paid the £16 admission for the exhibition just to see this. Photo: Knud Winckelmann (licensed under CCA). 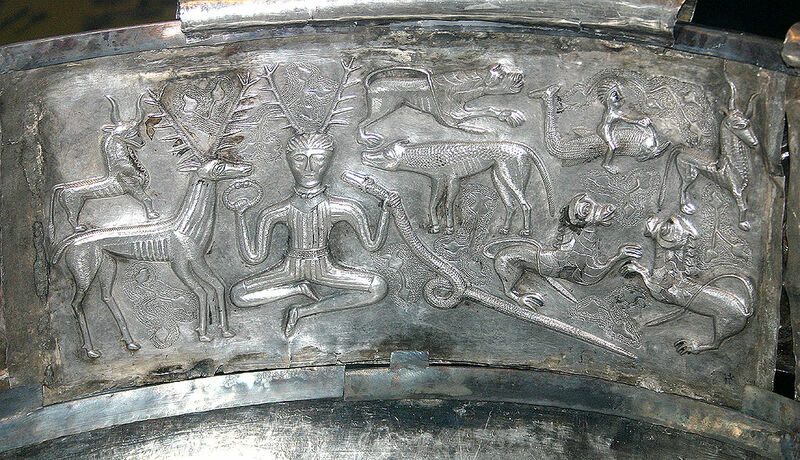 The horned figure depicted here on the cauldron, holding a torc in his right hand, and a serpent in his left, is thought by many specialists to represent the Celtic god, Cernunnos (Germanic speaking people may well have called him by a different name). Photo: Malene Thyssen (licensed under GNU). 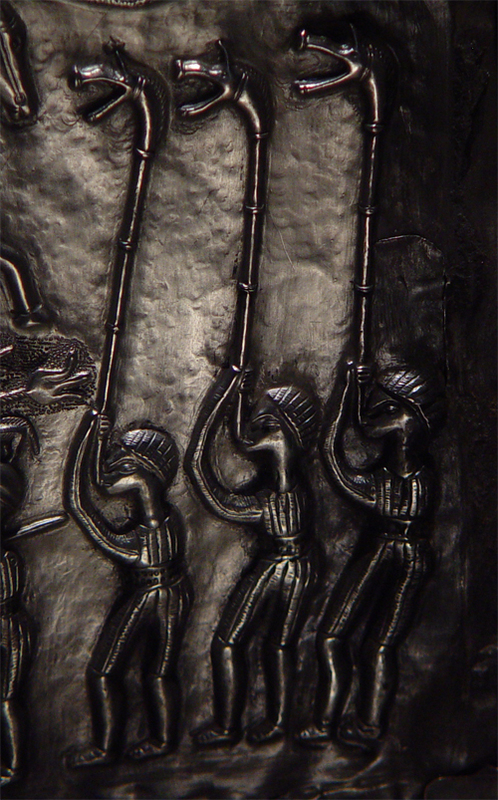 These figures on the cauldron are playing carnyxes, musical instruments that are known to have been used by "Celtic" (Gaulish) armies as they entered battle. Photo: Malene Thyssen (licensed under GNU). For me, the cauldron speaks of the fluidity of cultural identities in the part of Europe that lay beyond the borders of the Roman Empire. Tribal groups, some of them speaking languages ancestral to modern Welsh & Breton, others speaking languages ancestral to modern German & Swedish, knew of, and interacted with one another, sometimes fighting, but sometimes also feasting together, trading and intermarrying. 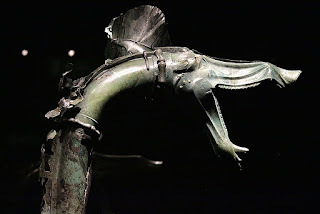 Bronze carnyx from Tintignac, France. The people who made and used this artefact are likely to have been Celtic-speaking Gauls. Photo: Claude Volette (licensed under CCA). 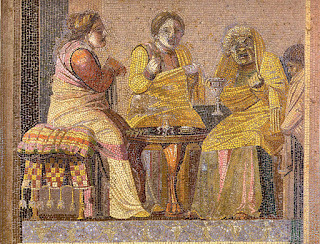 Celtic and Germanic speaking peoples may have had more in common than has sometimes been supposed, not only in terms of artistic expression, but also of religious practice. Their gods had different names, but many similar attributes, and they demanded human sacrifice, with ritually killed bodies found in bogs from Ireland to Denmark and northern Germany. The documentary presents this as a specific marker of "Celtic" identity, but it seems to have been a practice shared by "Celts" and "Germans." The British characters in my novel, An Accidental King, speak the "Celtic" language of pre-Roman Britain, wear "Celtic" jewellery and worship "Celtic" gods, but they see themselves not as "Celts," but rather as Regnenses (in Sussex), Catuvellauni (in the Thames Valley) and Trinovantes (in Essex). 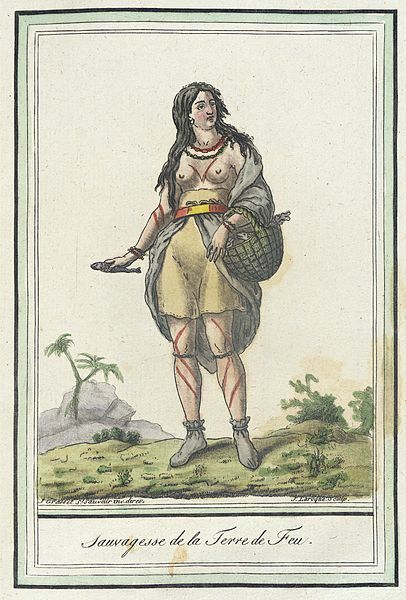 Some of them come to see themselves as "Britons," but this is a Roman concept, which, in the novel, seduces some of the native people of our islands, whilst alienating others. This, I imagine, is how things must have been, and it is why I find the vision offered by the British Museum more compelling and convincing than that of the BBC documentary. The British Museum exhibition "Celts - Art and Identity" runs until 31st January 2016. Advance booking is recommended. It is one thing to take an interest in history, quite another to immerse oneself in primary sources: the letters; diaries; administrative documents; even shopping lists and newspaper advertisements; that have survived from a particular moment in the past. Many prefer indirect narratives of history, whether in the form of museum exhibitions, documentary programmes on television, or historical novels. For those of us who create those narratives, however, primary sources, where we can find them, are an essential starting point. Historians are often sceptical about the first-hand testimonies that emerged from Germany in the aftermath of the defeat of the Third Reich. Many of these, especially the "diaries," were actually written up, in their present form, after the event, and and they are frequently at pains to emphasise the anti-Nazi credentials of their authors. 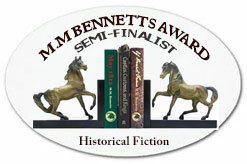 Novelists and historians alike must exercise careful judgement in the ways in which we use such documents. A USAF bombing raid over Berlin in 1944. 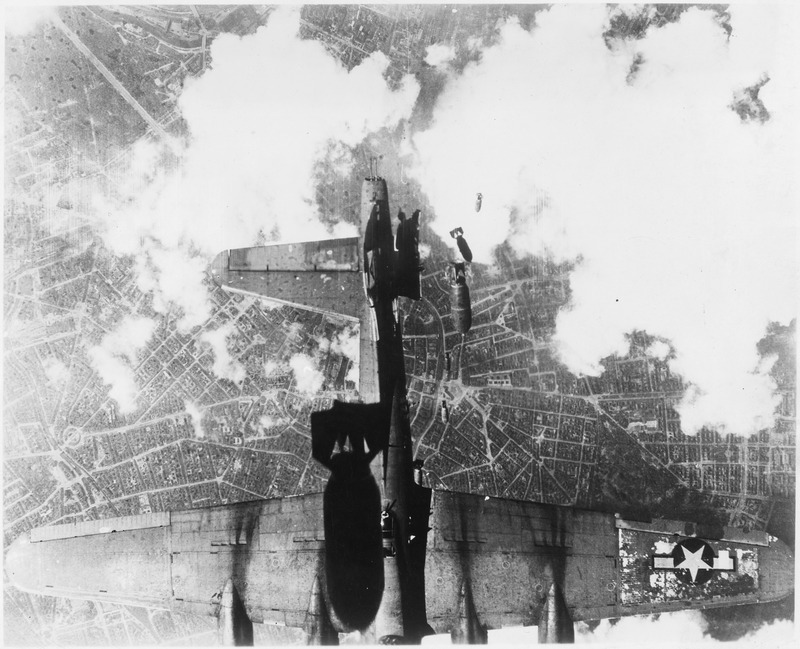 Between 1940 and 1945, the USAF dropped 23,000 tons of bombs over the city, and the RAF dropped more than 45,000 tons. 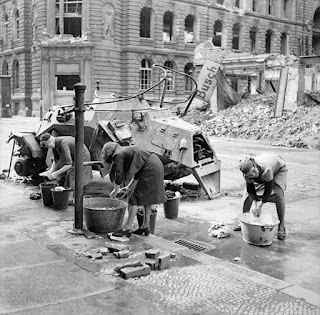 By May 1945, 1.7 million people (40% of the population), had fled. Photo: US National Archives & Records Administration, 197269 (reproduced with permission). 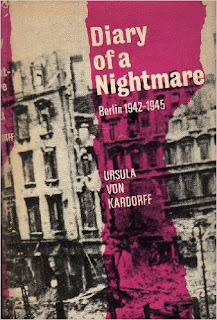 Ursula von Kardorff's "diary" of life in Berlin from 1942 to 1945 was written up for publication in 1947, presumably based on memory and brief, coded notes. A professional journalist, she makes no claim to have been a heroine of the resistance, but her diary does include comments that she is unlikely to have committed to paper during the war, since, if they had come to the attention of the Nazi authorities, they would certainly have brought disaster not only upon herself, but on many others (her social circle included most of those directly implicated in the 1944 plot against Hitler's life, and she was subsequently, questioned about this by the Gestapo). 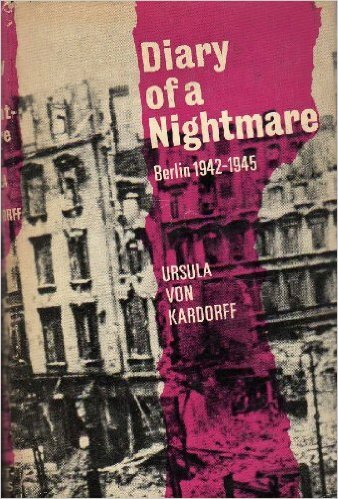 Von Kardorff's diary is more about survival than about resistance, and most of the key facts can easily be checked. It is the account of daily life that attracted me to it as a key source informing the letters written by my fictional character, Greta, in "The Spirit of the Times," the 20th Century story in my novel, Omphalos. The details of individual hardships, and inevitable gallows humour, certainly have the ring of truth about them. The following are excerpts from Von Kardorff's diary (the English translation is no longer in print, but used copies are available, and copies are likely to be available in many libraries). "13th July 1943. A cynical joke is doing the rounds. A man is dug out after being buried in rubble for two days. His wife and child are dead, and he himself has lost his left arm, a leg and an eye, but he raises his remaining arm in salute and says 'Heil Hitler - Danzig is German, and that's the main thing!'" "25th November 1943. The zoo was badly hit ... Many of the animals were killed, and others escaped. It is odd to think that a tiger might bob up at any moment ... towards morning we lay down and tried to get some sleep. Papa was on his rubble-covered bed ... Today Klaus and I tried to get things in order. We swept and scrubbed and carried piles of broken glass onto the balcony. We carted buckets of water up four flights of stairs, and managed to get at least one room into habitable condition." "25th January 1944. I went into the zoo shelter when the seven o'clock warning sounded. It was eerie. The ack-ack had already opened fire, and a herd of human animals began to file towards the entrances of the shelter, which are too small, and far too narrow ... The walls of the shelter, made of massive blocks of stone, look like a stage-set for the prison scene in Fidelio. Snarling policemen drive the unwilling crowd slowly up the stairs, in order to divide them out onto the different floors of the shelter." The entrance to the air-raid shelter at Berlin zoo. Anti-aircraft guns were mounted on top of it. 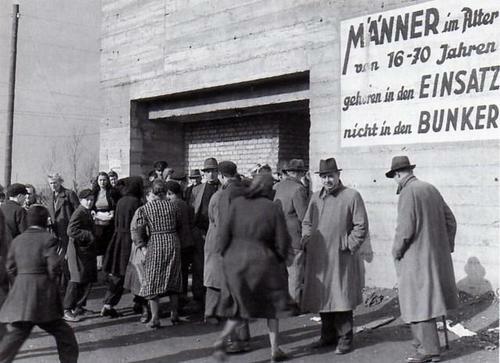 The sign reads: "Men between 16 & 70 years old belong at the front, not in the bunker." 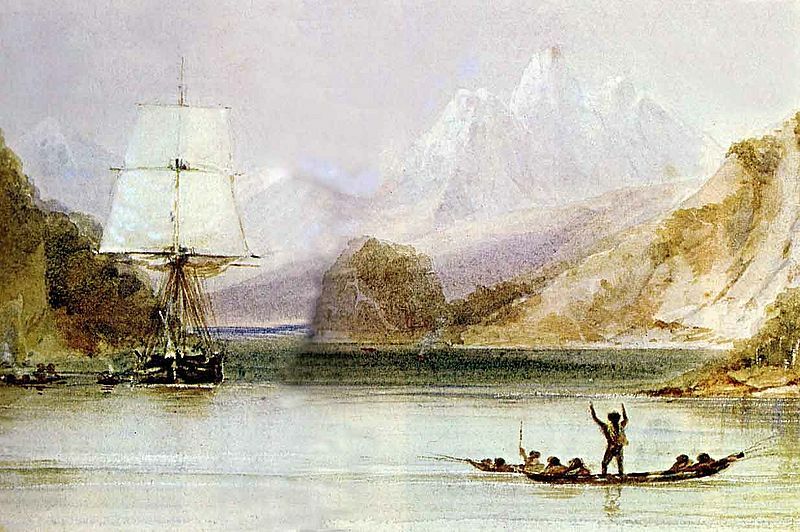 Image is in the Public Domain. "12th April 1944. I walked home from the zoo because the weather was so fine ... The oriental buildings, in comically poor taste, stand there half-gutted. I peeped in through the cracks in the walls, but could see only crows. Sheep were grazing in one spot, and there was a smell of horse manure. I felt homesick for the country, but even here there is something beautiful about springtime. 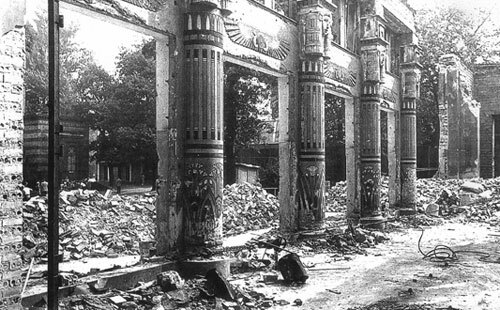 The Tiergarten is in full-bloom, in spite of the bomb craters." The bombed ostrich house of the Berlin zoo. Many animals were killed, and many more were shot by troops after escaping. Presumably they were eaten (meat being in very short supply), but not, apparently, by von Kardorff. Image is in the Public Domain. "20th September 1945. So this is Berlin. Fascinating and depressing. Everyone is hungry. All the people look half out of their minds, utterly worn out by the struggle for existence. In spite of everything, they are kind. They have been through Hell, whilst we have been living on the fat of the land in Swabia. It is shaming, but none of our friends reproach us. In the evening I went to the Kunfurstendam. Pretty girls with combs in their hair, and handbags slung on their shoulders, were strolling about with British, French and American soldiers ... Hot jazz resounds from bars which only serve hot drinks, and where there is nothing to eat." German women washing clothes at a water hydrant, in July 1945, beside the wreck of an armoured car. Photo: Imperial War Museum, non-commercial license BU 8609. It is precisely documents such as these, whether published (as here) or in archives, that provide historical novelists with the details of sights, sounds and smells, the sense of lives disrupted but also of life going on despite everything, that allow us to animate a time and a place that we never experienced, could not have experienced and, in truth, would not want to have experienced for ourselves. Ai Weiwei's current exhibition at the Royal Academy of Arts is his first major retrospective in the United Kingdom. His name has long been familiar to most of us, and many of us would recognise him if he passed us on the street. We know of his courageous advocacy of human rights in his native China, and of his suppression and imprisonment by the Chinese authorities, but of his work, that which actually defines his project as an artist, we have so far seen little. The current exhibition changes all of that. The first thing that struck me, on entering the exhibition, is the enormous scale on which Ai works. This is not a lone dissident labouring away in a dingy basement, but rather the director of a vast atelier, the output of which includes the heaviest work of art ever to have sat on the floorboards of the Royal Academy. In fact, the word "dissident" tells only one part of the story. Ai has acquired shares in a quarry producing stone for his workshop; he has craftsmen from many specialisations working for him (in his promotion of traditional Chinese carpentry, stone-working and ceramic manufacture, he resembles a John Ruskin or a William Morris); perhaps most significantly of all, he has the facility to store and transport colossal pieces of sculpture. Surely none of this could have been achieved without friends, as well as foes, in the upper echelons of the Chinese establishment. Those friends notwithstanding, it was a brave decision on Ai's part, after spending twelve years in exile in the United States, to return to China in 1993. A brave decision, but a fruitful one, for this body of work could certainly not have been produced anywhere else. 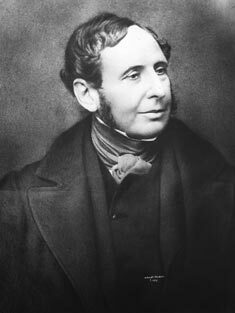 The transformation of China, and especially its urban landscapes, over the past thirty years is on a scale not paralleled in Europe since the mid-nineteenth Century (Charles Dickens, on the pages of Dombey and Son, gives us a close approximation). 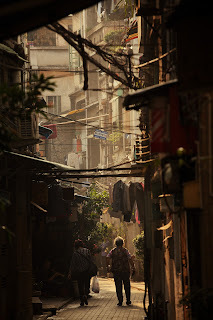 A traditional hutong in Guangzhou. Photo: Symane (licensed under CCA). I first visited China on University business in 2001, and, for the next eight years, I made at least one, sometimes two, visits each year. Without fail, each time I arrived in Beijing, Guangzhou or Shanghai, I would get lost. Everything was changing, nothing remained still, and I never stepped twice onto the same streets. There were very good reasons for these changes: quaint and atmospheric as they may have been, the houses of the narrow, traditional hutong streets lacked all modern facilities, and posed an all-too-obvious fire risk. If much was gained, however, something was also being lost. 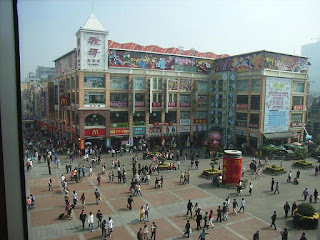 Guangzhou's Shang Kia Jiu Square. 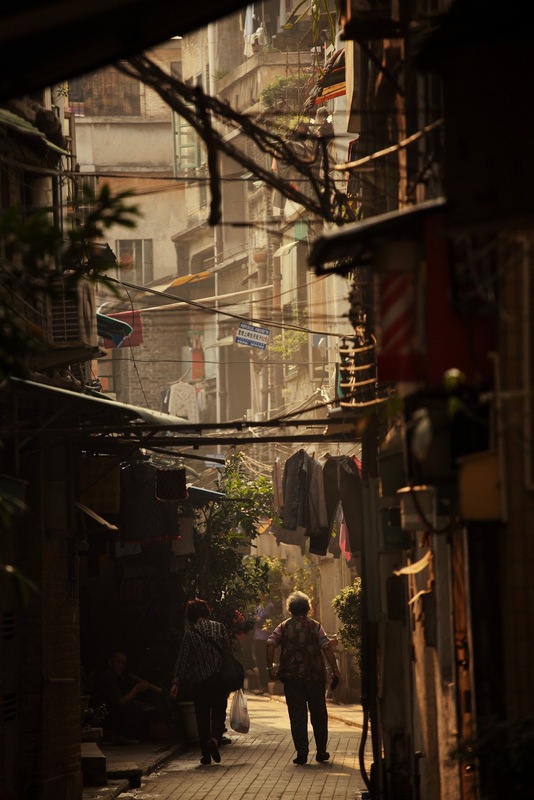 Photo: Sha Mian Ren (licensed under CCA). 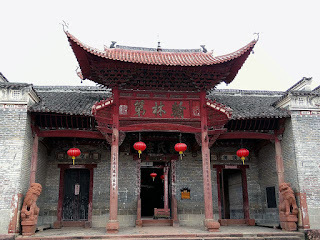 At the heart of every community in Qing Dynasty (1644-1912) China was a clan temple, part of an ancestor-cult that dates back to the age of Confucius (551-479 BC). Here weddings were solemnised, prayers were said for the recently departed and, in at least some cases, young men were prepared for the gruelling examinations for the Imperial civil service. Many of these were still standing (though fewer were in active use) in 1993; I peered into a few derelict examples in 2001 and 2002; only a handful are still standing today, protected as ancient monuments and open to tourists. 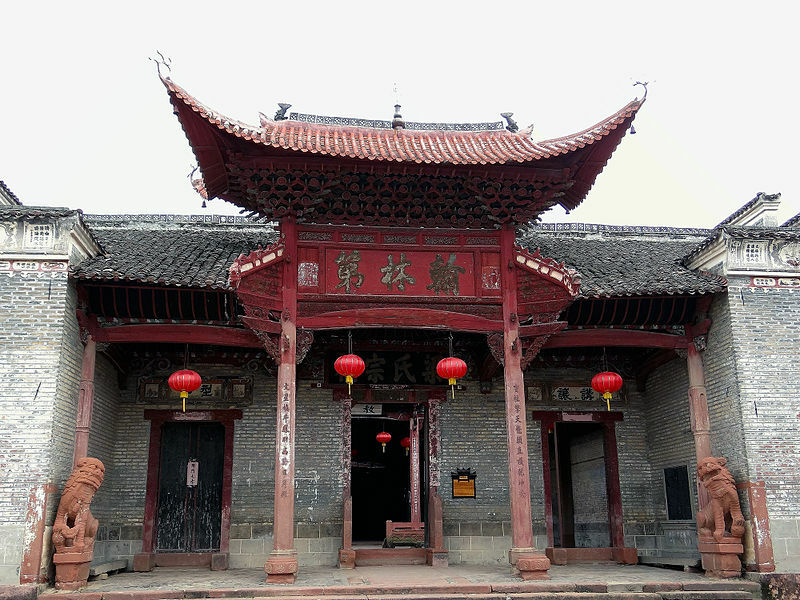 The Liang Clan Shrine, Jiangxi. Photo: Symane (licensed under CCA). Ai Weiwei and his collaborators collected a great volume of wood from the demolished temples, and used it to make sculptural installations. They also collected abandoned furniture from the houses of the hutongs, and combined these into new and imaginative arrangements. Ai is not, I think, suggesting a return to the past, but he is, perhaps, making some space for its ghosts; insisting, rather as John Betjeman did for Victorian architecture, that there is value in engaging with the past, even as society moves on from it. "Bed,"by Ai Weiwei, made from salvaged "ironwood" (hornbeam) from Qing Dynasty temples. Photo: Pittigrilli (licensed under CCA). 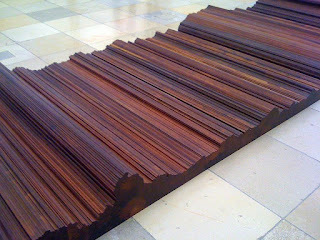 "Fragments," by Ai Weiwei, made from salvaged "ironwood" from Qing Dynasty temples. 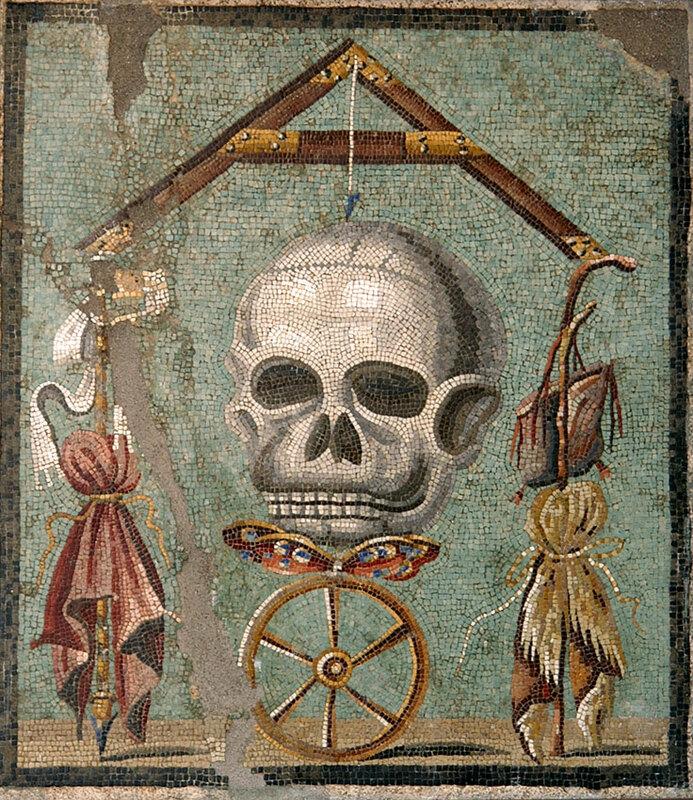 Photo: www.wikiart.com (licensed under CCA). "Chairs," by Ai Weiwei, made from salvaged Qing Dynasty furniture. 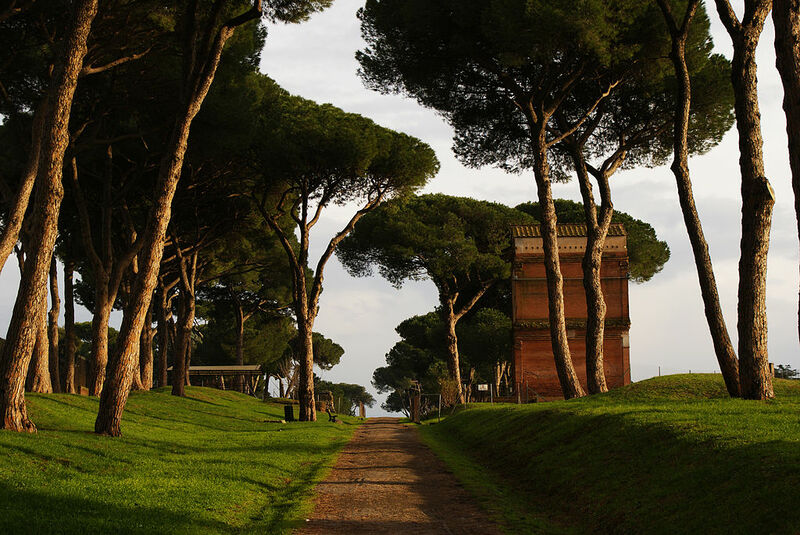 Photo: Pittigrilli (image is in the Public Domain). Nor does he stop with the Qing Dynasty. More controversially, he has "destroyed" (he prefers to say "transformed") and over-painted vases from China's Han Dynasty (206 BC-220 AD), and even pulverised "Neolithic" pottery. The boundaries between protest, satire and creativity, here, are blurred. I have walked through the antique markets where he acquired these vessels with Chinese archaeologists, who assured me that most of the pieces offered for sale were fakes. "All the same," said one of these colleagues, "you wouldn't want to be caught at the airport with one of these in your luggage!" 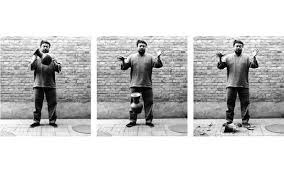 Ai Weiwei "dropping a Han Dynasty vase" (image is in the Public Domain). Over-painted "Han Dynasty vase," by Ai Weiwei. Photo: Victoriagrigas (licensed under CCA). 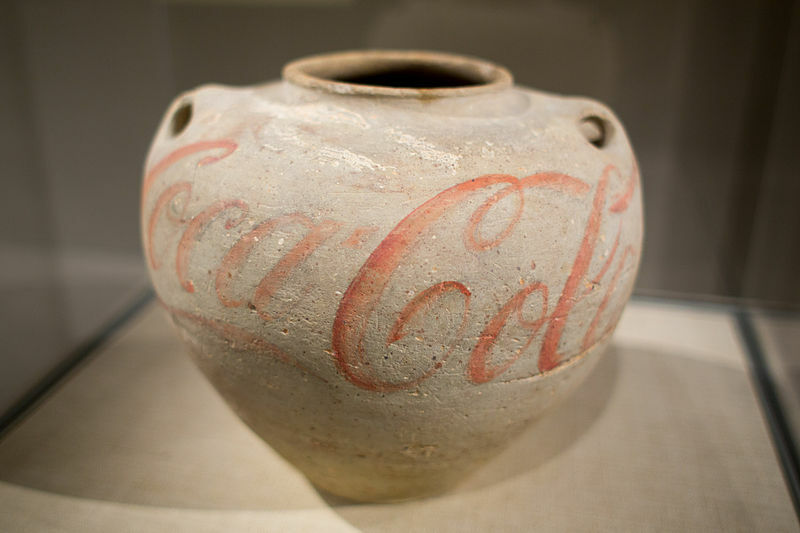 "Dust to Dust," by Ai Weiwei ("pulverised Neolithic pottery in glass urn"). Photo: Pittigrilli (licensed under CCA). If Ai Weiwei's engagement with the Ghosts of China Past have been, for the most part, playful, his interaction with the Ghosts of China Present have been far more problematic in terms of his relationship with the regime. No artist or writer could respond playfully to the tragedy of the Sichuan earthquake of 2008, especially when it became clear that the death-toll was made much higher by the corrupt actions of local officials, cutting corners with even the lax building standards that apply in China. Ai Weiwei courageously published the names of the victims, thereby subverting an official attempt to cover up the scale of the tragedy. It was this, more than anything else, that prompted his arrest, detention and torture, highlighted in the exhibition by a series of menacing fibreglass dioramas. "S.A.C.R.E.D," by Ai Weiwei. Photo: Abxbay (licensed under CCA). There have been few exhibitions in London in recent years that have generated quite the sense of anticipation that I sensed around this one. Whilst he has been known to us as a "personality," Ai Weiwei's work has, for most of us, been a "known unknown." Now revealed to us, I can only encourage people to see it for themselves. The Ai Weiwei Exhibition at London's Royal Academy runs until 13th December. Advance booking is strongly recommended.